This image was totally unplanned. 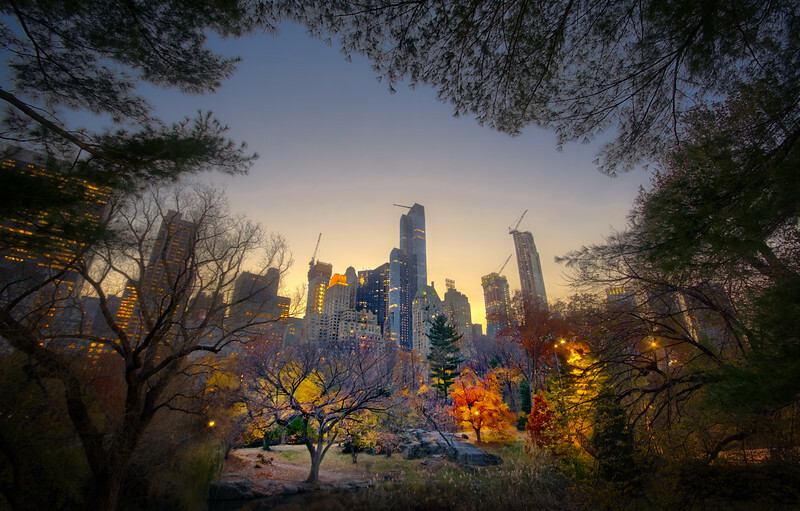 When I went to Central Park, I hoped to spend the evning on the rooftop of the Metropolitan Museum of Art - from where I have been told you can look over the trees in the Park and get an awesome view! So I rocked up at the museum just in time for sunset, went in... and they told me that the rooftop is closed in the winter. This was bad - so I decided to simply run back to the southern entrance of Central Park (that is about 1.8 km!) to get at least the rest of the sunset with what I remembered to be an awesome skyline. I made it just in time - the light in the buildings were already on, but this only added to the last light that I could see from the sunset and made it more interesting. In the end I was not too mad that I missed the sunset that I had planned. After all, I probably should have seen that when checking and researching haha.